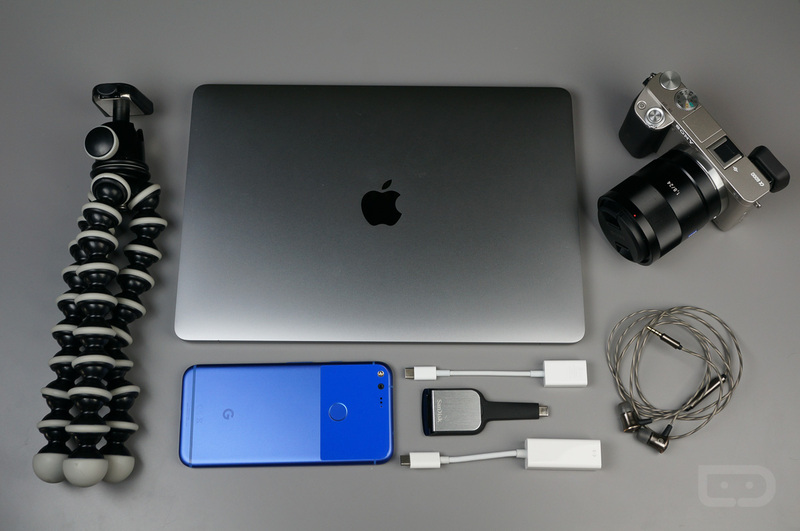 CES 2017: What’s In Our Bags? This week, we will be attending our seventh CES down in Las Vegas, NV, and each year, we are asked what we’re taking with us and what advice we have for first time attendees. Well, this post should deliver all of the intel you desire. 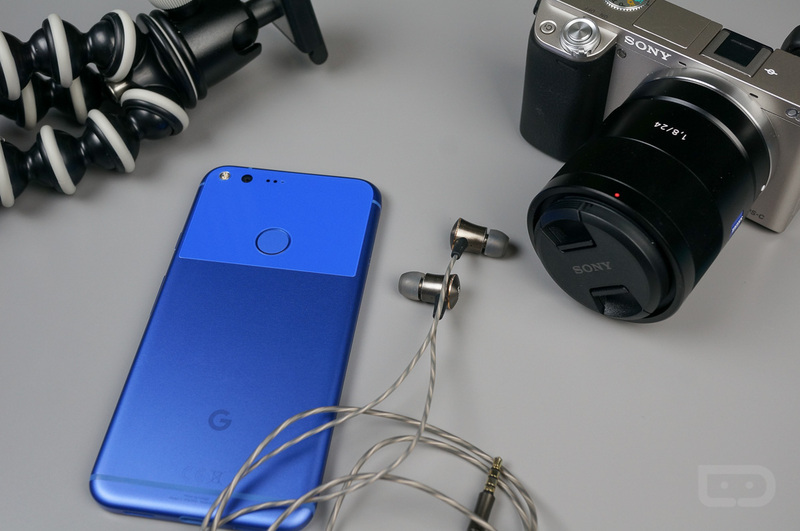 From camera equipment to the phones we trust to make it through a day on the showroom floor, everything we are taking has been pictured and detailed below. Should you need more specific information on the equipment, ask us in the comments and we would be happy to enlighten you. 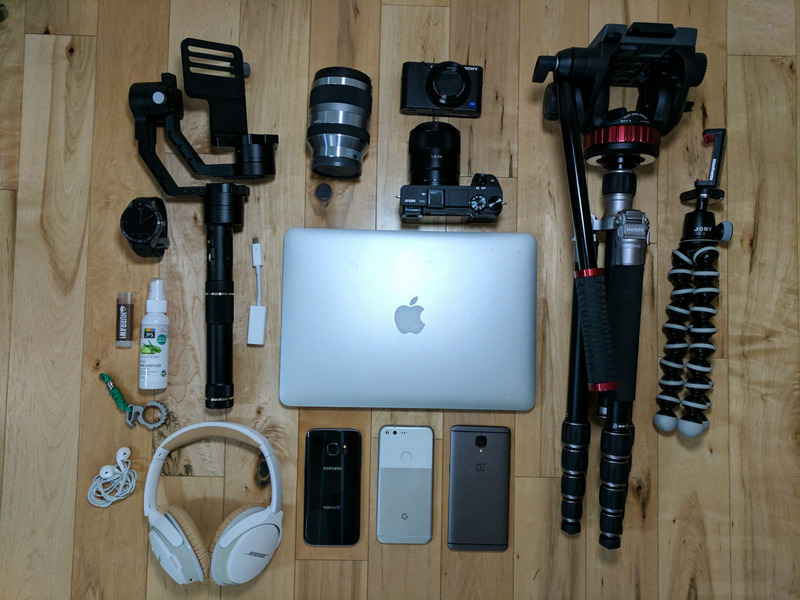 As you can see, Kellen will be managing the bulk of camera equipment we bring down to CES. In order to provide the top notch quality you expect, we’ll be on site with a Sony a6300 and Sony RX100MV, complete with various lenses and tripods for whatever the shot may call for. We will also bring down one of our beloved Zhiyun Crane Gimbals. For phones, Kellen is opting for the Google Pixel (white), OnePlus 3T (because he really wants Nougat), plus a Galaxy S7. One of these devices will handle any WiFi tethering we may need, since WiFi coverage inside of these event spaces is sometimes limited beyond belief. On his person, Kellen will wear the TAG Heuer Connected (he really loves that thing), plus an assortment of products such as chapstick, hand sanitizer, and a bottle opener for all the beer we intend to consume. If you want to shop for any of this gear, check it out through this Kit link. Unlike prior years, I’ve found that less is more when it comes to traveling for work. Because Kellen will bring down essentially everything we need for video equipment, all I will really need is my laptop, phone, plus a camera for when we aren’t roaming the showroom floor together. On top of that, Kellen handles the WiFi tethering from his devices, so while he brings multiple phones, I should get by just fine bringing only one phone. I may bring an emergency phone, just in case one craps out on me. In past years, I would also bring an Android tablet, smartwatch and other stuff, but really, to ensure I have the smallest chance of something going wrong or dying on me, I’m just leaving that stuff at home. This also goes along with the theory that if I am headed to Vegas with a full bag of stuff, there’s no way I’d be able to haul any potential swag or goodies I get at the show back home. I must ensure there’s always room for CES swag. A couple things not pictured that will be on me at all times is hand sanitizer, as well as protein bars or some type of granola bar. With how much walking we do at CES, you need to provide your body with energy all of the time. For the sanitizer, I can’t tell you how many strangers and people you run into, plus all the hands you shake, so it’s always good to have a bottle of hand sanitizer with you. Another important rule: Stay hydrated! Have any questions? Throw them below!